Residents invited to attend unprecedented community forum. 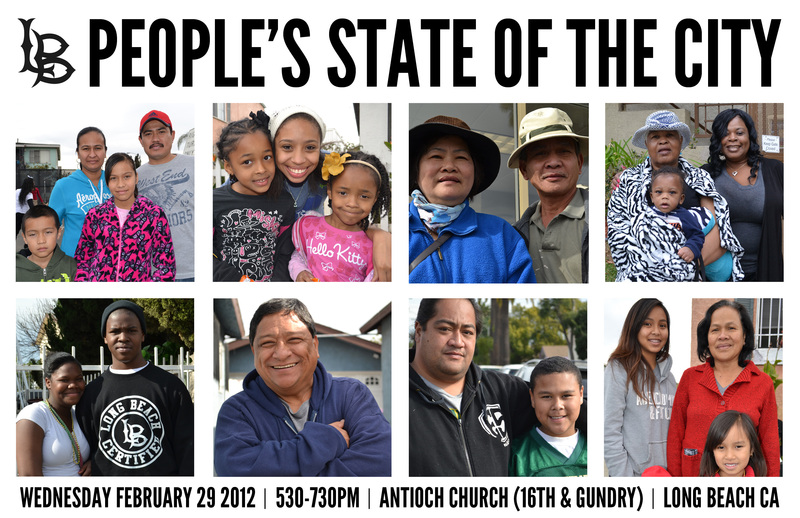 Long Beach, Calif. – On Wednesday, February 29th, residents from across the city will gather for Long Beach’s first-ever People’s State of the City. This free event will bring together community members to discuss the issues impacting Long Beach during these challenging times, such as the health and safety of our neighborhoods, theavailability of living-wage jobs and affordable housing, and access to quality education. 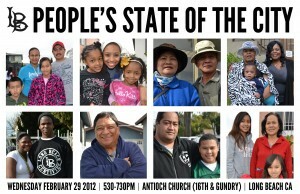 The People’s State of the City will be held at Antioch Church at 1535 Gundry Ave. in Long Beach. Doors open at 5:30pm with the program scheduled from 6-7:30pm. Light refreshments will be served at the mixer. Childwatch and Spanish and Khmer translation will be available. Porter Gilberg from The Center Long Beach, one of the event’s co-sponsors, said, “We look forward to presenting a program that addresses the underrepresented issues impacting so many working people in Long Beach. We encourage anyone interested in being a part of the change they would like to see in our community to attend this unprecedented event in our city.” Mayor Bob Foster and all Long Beach city council members have also been formally invited to attend. Other event sponsors include ‘Aikona, AnakBayan, Building Healthy Communities (Long Beach), California Faculty Association (Long Beach), Californians for Justice, Clergy and Laity United for Economic Justice (South Bay), Community Leadership Institute, CSULB Political Science Student Association, Filipino Migrant Center, Green Long Beach!, Housing Long Beach, Long Beach Area Peace Network, LBCC Community Studies, LBCC Community College Association, Long Beach Coalition for Good Jobs and a Healthy Community, Long Beach Time Exchange, Los Angeles Alliance for a New Economy, 100 Black Men, and Shift Long Beach.